Scotland manager Gordon Strachan is calling for calm heads in the vital Euro 2016 qualifier against Poland. Defeat at Hampden next month would end hopes of reaching the play-offs and Strachan is wary of overzealousness. 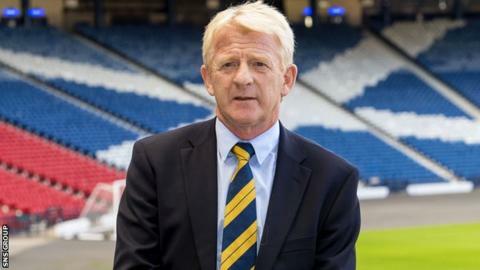 "Emotional players can cause you bother and until now and I am sure it will continue, we have been focused rather than emotional," said Strachan. "We can only deal with the games we are involved in. The first one against Poland is going to be a huge game." Scotland sit fourth in Group D going into their final two fixtures against the Poles on 8 October and Gibraltar in Portugal three days later. After losing to Georgia and Germany in their last double-header, Scotland are four points behind Republic of Ireland, six behind Poland and eight behind leaders Germany as they strive for third place. "We are still in there," said Strachan. "We can't deal with what happens elsewhere. "It is going to be a great occasion, a fantastic occasion, a pressurised occasion but we like that as footballers. "The whole nation was disappointed (after last two results), which is understandable. "We are up for it again, that is the good thing about us." Scotland beat Poland 1-0 in a Warsaw friendly in March 2014 before a 2-2 draw at the same venue seven months later in Group D.
Poland's star striker Robert Lewandowski is in great form with seven goals in his last two games for Bayern Munich and Strachan described the 27-year-old as "world class". "They are a good side, they have improved immensely since we played them in a friendly two years ago," he added. "We know he's [Lewandowski] there but we managed to score two against them over there with him in the team. "We don't have a world class player but we have a great bunch of lads and we know we have to work as a group." Strachan is out of contract at the end of the campaign but insists he is not looking any further than the next two matches. "I have never thought about my future wherever I have been in football," he said. "I just continue and see where I end up. It's good fun, you know. "We will speak about it once it (the campaign) is out of the way. The games are far more important than me. "I love football and I love what I am doing now, that is for sure. "But as I say we will talk about it when we finish this campaign and hopefully it has another few months to run now."